T.M. 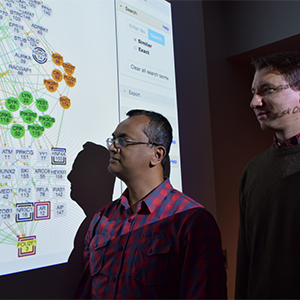 Murali, professor, (left) and Kurt Luther (right), assistant professor, both in the Department of Computer Science, stand in front an example of the kinds of graphic designs they will crowdsource to visualize the effects of chemical pollutants on cells. Chemical pollutants in the environment can have wide-ranging detrimental effects on human health causing everything from respiratory disease to neurological dysfunction. While certain chemicals and their effects on cells are well understood by scientists, such as the hormone-disrupting chemical BPA, little is known about the effects of tens of thousands of other common industrial environmental pollutants — and whether or how they may be damaging our cells at the molecular level. Two Virginia Tech researchers in the College of Engineering’s Department of Computer Science recently received funding to begin tracking the effects of everyday chemical pollutants on human cells by depicting clear relationships between protein-based cell networks and their disruptors using crowdsourced visual graphs. Crowdsourcing — soliciting large numbers of people primarily via the internet to offer data, services, or ideas — has come into vogue for scientists as a scalable way to collect and manage large amounts of data while engaging the public in scientific research. In this case, users will create graphs of proteins and their cell networks that evoke abstract artistic sensibilities utilizing minimal lines, simple shapes, and primary colors. Luther and his partner, Professor T.M. Murali, are both principal investigators on the project and ultimately hope to make the graphs more useful for the biomedical community to track effects of pollutants. Chemicals affect cells by disrupting proteins and changing how they interact and control one another. The affected proteins and interactions are typically represented as networks where a node represents a protein and an edge represents an interaction. Trained biologists often manually manipulate automatically determined positions until the network conﬁguration matches their knowledge and instinct for placement of proteins and their networks. The process is time-consuming and requires signiﬁcant expertise in a specialized field. The system Murali and Luther plan to develop will use automatically generated biological cues to guide users on where to place shapes that represent proteins and their interactions, how to group them, and which elements to ignore. It will also enable users to highlight sequences of molecular interactions that suggest how a chemical may control speciﬁc proteins and processes that occur in the cell. The team will collect data in three different ways — through Zooniverse, a volunteer-based citizen scientist research organization; paid workers on Amazon Mechanical Turk, a human intelligence task aggregator; and undergraduates majoring in biology. Murali and Luther will also conduct a review by an expert panel of biomedical scientists to evaluate the effectiveness of the system in creating visualizations of chemical response networks and the value this system provides in assisting them to formulate biological hypotheses. The project is funded by the National Institutes of Health through its Big Data to Knowledge initiative.